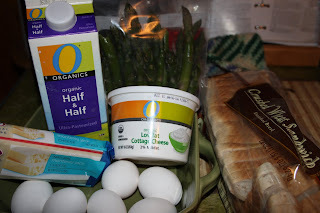 Extended Life for: Eggs, Half & Half, Monterrey Jack Cheese, Asparagus, Cottage Cheese, and Sandwich Bread A few posts back I mentioned my love of Strata's. This one turned out exceptionally well. It served as a perfect meal for Family Dinner night with Harrington's and lasted us well into the next week. Grease bottom of square baking dish. Tear or cut bread into 1 inch pieces and lay on bottom of pan. 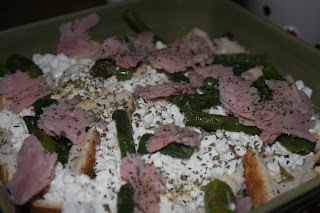 Next, layer some of the grated cheese and cottage cheese, followed by ham and asparagus. Continue layering until there are no more ingredients. 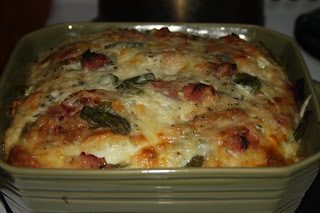 In a separate bowl mix half-and-half, eggs and spices, pour over bread, cheese, ham and asparagus layers. Top with extra grated cheese if available. Refrigerate minimum of an hour, up to overnight. Remove from fridge 20-30 minutes before placing in the oven. Bake for 50-55 minutes at 350 or until puffed, golden brown and lightly set in the center. Enjoy with family and friends.